Extra Details: I began with a panel of cream colored cardstock. I stamped some birch trees on each panel, keeping them off the center area. I added a kraft colored hillside to each panel. 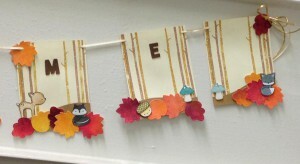 I inks smooshed some fall colors onto water color paper, let it dry, and die cut a lot of leaves from the Fall Tiny Tags I added these to the bottom of the panels. I added a few to the top for interest. Then, I raided my box of pre-colored and cut images. I pulled out all of the forest critters that I could find. I adhered these around the bottoms of the panels as well. 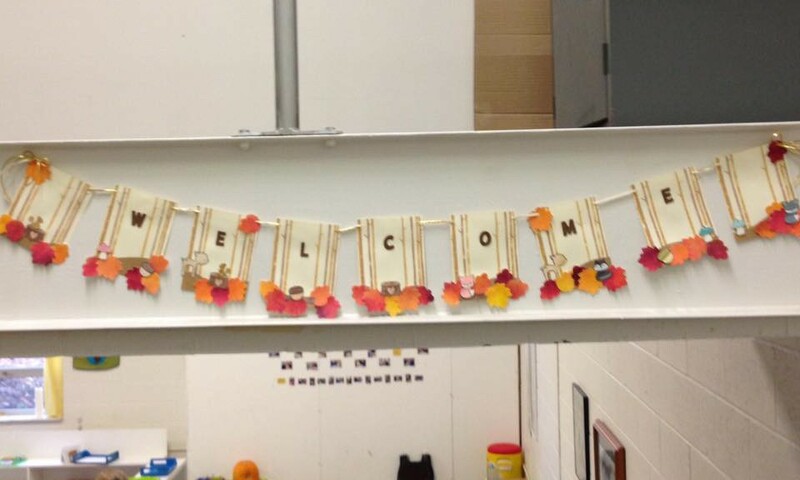 Lastly, I die cut the letters for the work WELCOME from some kraft, yellow, orange, red and brown cardstocks. I layered the letters together to make a thick embellishment and adhered them to the middle of the panels. I watched Nichol Spor create her beautiful tags on Lawn Fawn’s YouTube Channel and I knew I wanted to give that idea a try. 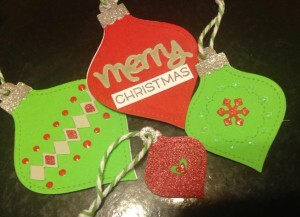 I used all the sizes of the Stitched Ornaments dies and I used more traditional Christmas colors than Nichol did. In the end I made 72 tags. I love the way they turned out. Extra Details: I began with a full sheet of card stock in six colors; red, Kelly green, apple green, grey, glitter red and glitter green. I cut four of each size of ornament from each color. I also die cut a merry word from each color and a number of snowflakes, hearts and the line of diamonds. I also die cut the backers for each tag from white card stock and the ornament toppers from silver glitter card stock. Then I spend a lot of time gluing everything together. 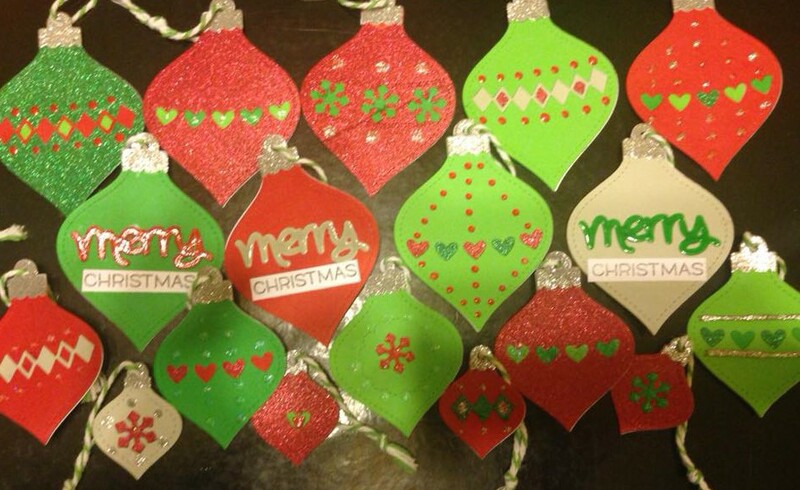 It was fun to play with all of the different elements to create ornaments that went together but didn’t all match. For the finishing details, I used Glossy Accents on the scripty merrys. 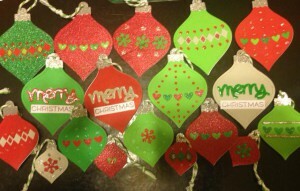 I used fabric puffy paints in clear glitter, silver glitter and red to add dimensional dots to the ornaments. I think that the puffy paints worked well. Hope you enjoyed the tags! Extra Details: I began these cards by water coloring half sheets of water color paper with Distress Inks. I did one half sheet with red inks and the other with greens. Once the inks were dry, I die cut them with a stitched circle die. I was able to get six circles from each half sheet. 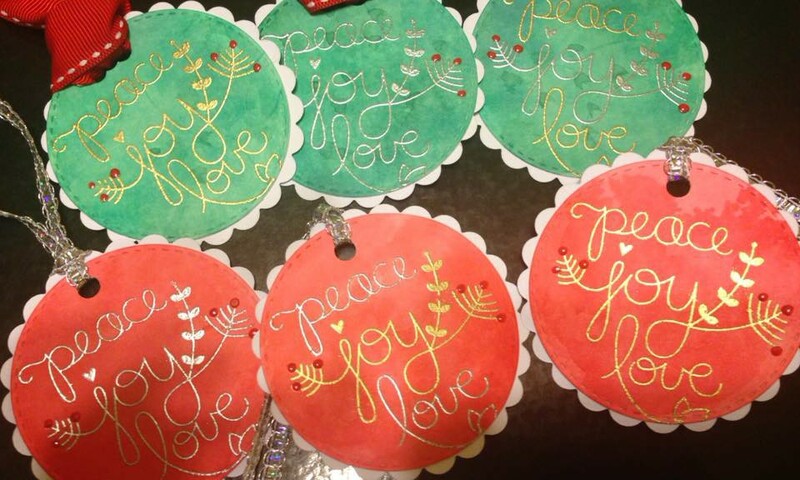 I used Versa Mark ink, gold and silver embossing powder to add the sentiments to each circle. I added the red berries with some puffy paint. I think it added some fun dimension. While the puffy paint was drying, I die cut some white scalloped circles to back each water colored circle with. I adhered the two circles together; hole punched a hole, and added some ribbon. 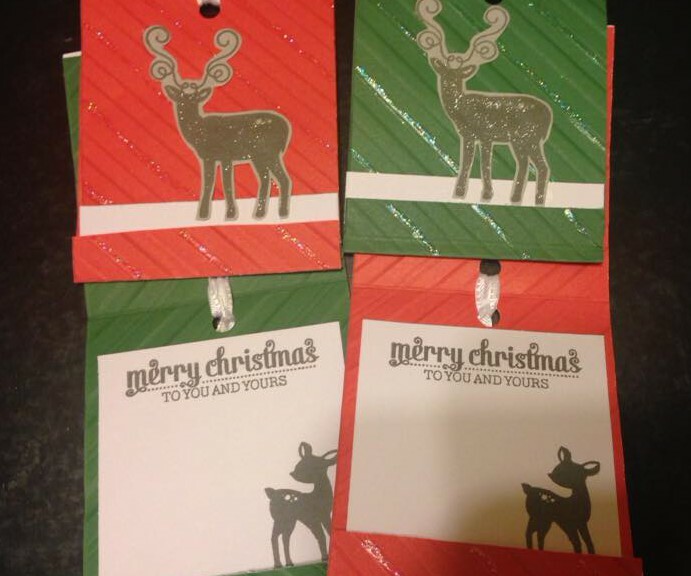 I just love creating Christmas Tags. They are small, usually easy to make multiples of, and allow to experiment with a lot of different ideas. Here are a few more tags I made this season. 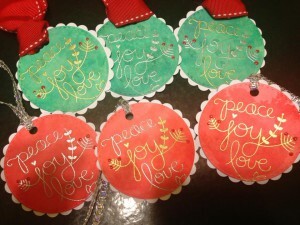 Extra Details: I began these tags with some pre-embossed paper I found at my local big box craft store. The paper comes in 5.5 x 7.5 sheets. I cut the paper in half and folded it into a match book. I folded about 1 inch at the bottom and about 3.25 inches from the top. Next, I created the white liners for the inside of the tags. I stamped the fawn image and the sentiment in a dark grey ink. I adhered the liners to the inside of the tags. I stamped the larger deer and antlers on some grey card stock using the same dark grey ink. I fussy cut them out leaving a small border. I also added some Wink of Stella Clear Glitter pen to the deer’s body. I added some clear glitter glue to the strips of the embossed paper for adder glitter. 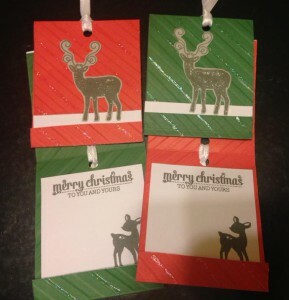 I used a hole punch and white ribbon on the top of the tags. Lastly, I adhered a small strip of white paper to the bottom edge of the top flap and the larger deer. A family friend just turned seven and celebrated with a Lego Ninjago Birthday. I could resist sending him a Tiny Ninja card. I adjusted the coloring to better match the Lego characters. 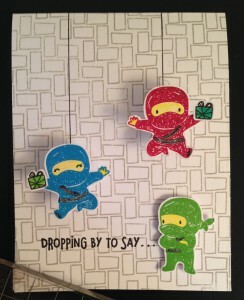 Extra Details: I began this card by stamping the ninjas in colored ink. I also stamped some packages. 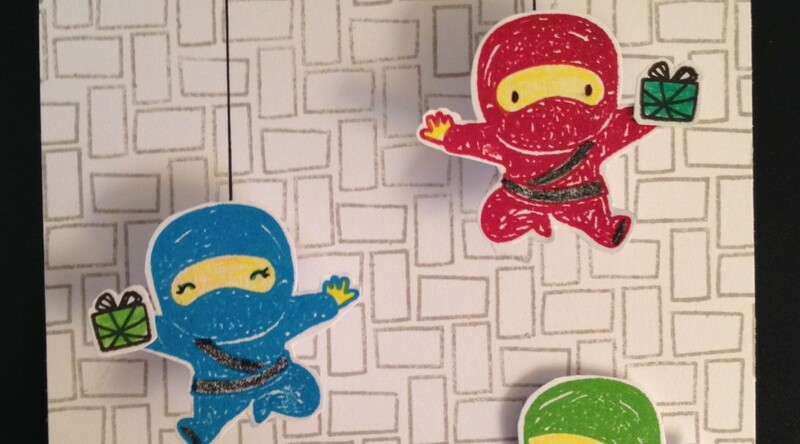 I colored the ninjas’ faces and hands with a yellow colored pencil to make them look like Lego people. Then I fussy cut everything out leaving a small white border. I created a white card base. I stamped an interlocking brick pattern on the card front using a grey ink. 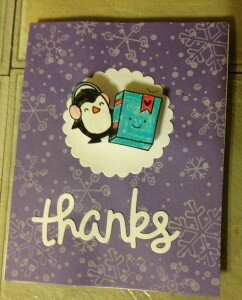 I added the sentiment to the outside and inside of the card with black ink. I adhered the green ninja flat to the inside of the card. 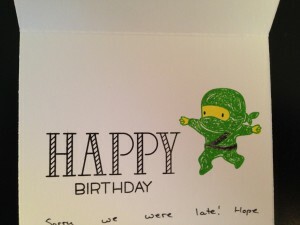 I used foam tape on the green ninja on the card front. The red and blue ninja are adhered with mini action wobbles. The last thing I did was to draw the strings that are holding the ninjas up. My son needed to send a thank you card to one of his grandmothers. This is the card he designed for her. I love the white pigment ink on the purple background. I may be using this idea again. Extra Details: We began by stamping the white snow all over the purple panel. We used the background stamp for Snow Cool and some snowflake images from Frosties. The layer looked is really cool. Then, I stamp the penguin and book images. My son used colored pencils to color the images in. I fussy cut them out and adhered them together. 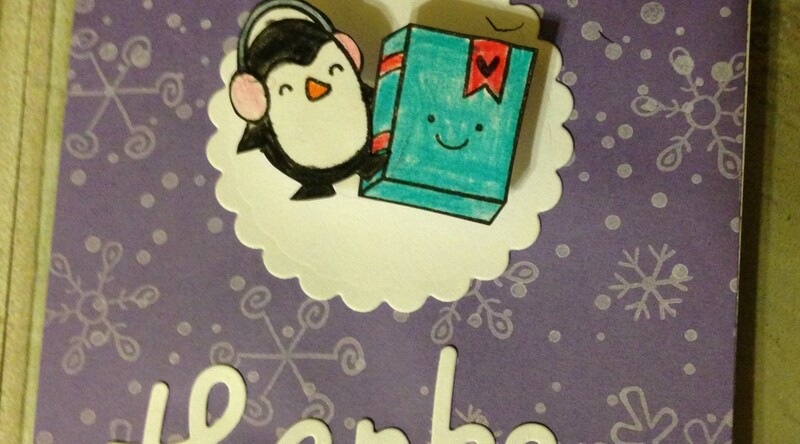 We used a mini action wobble to adhere the penguin and book to a scalloped circle cut from white card stock. Next, we adhered the purple panel to a white card base and adhered the scalloped circle to the card front. Lastly, we adhered a scripty Thanks die cut. My November 2017 Simon Says Stamp Monthly Card Kit was lost in the mail for almost three weeks. Luckily, it still arrived. 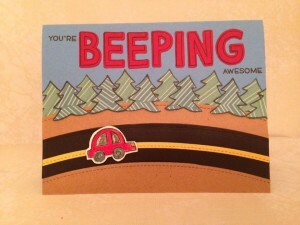 This is the first card I made with it. Extra Details: This card was super simple to put together. I covered a white card base with some of the patterned paper. I adhered one of the manufacturing strips across the middle of the card. I cut the alpha paper apart so I could create the work “Thanks.” I used foam tape to pop the letter up off the card front and made sure to cover the hole in the manufacturing stip. That was it and the card was finished. 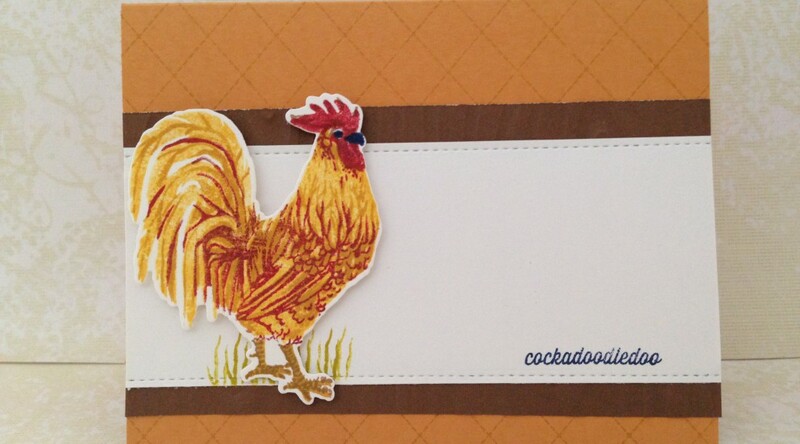 I made these cards at the same time I made the Rooster Pop Up Cards. I don’t know why I didn’t blog them at the same time. 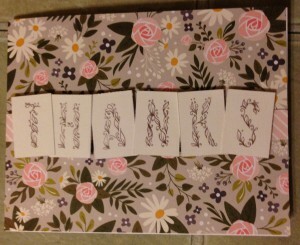 Extra Details: I began these cards by die cutting some white paper. Because these are layering stamps, I find it easier to die cut before stamping. I never get the feet in the right space if I stamp before die cutting. I die cut four of each image to be on the safe side. I used the first two on the Rooster Pop Up Cards and the extras on these cards. I placed the negative areas in my MISTI and lined the stamps. I placed the die cuts in the negative spaces to stamp each of the layers. I found this to be really easy and accurate way to stamp these images. Next, I created two card bases from pumpkin colored card stock. I used Hero Art’s Pumpkin Pie ink to add the quilting lines. I also added a white liner to the inside of each card base. I cut a long rectangle of white card stock to layer my images for the front of the card one. I dry embossed a stitched detail to each edge of the white card stock. I added two small strips of embossed brown card stock to each edge of the white rectangles. I adhered this panel to the center of each card base. I stamped the sentiment in a navy ink and the grass in an olive green ink. 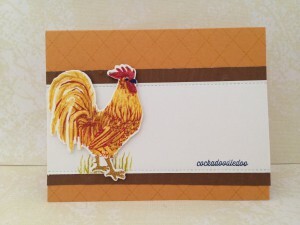 I used foam dots to adhere the roosters to the card fronts. 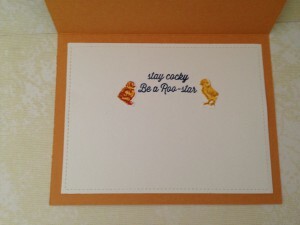 For the inside of the cards, I stamped an additional sentiment and added the chicks. 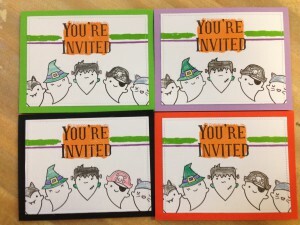 These are the invitations that my son designed for his birthday party in October. 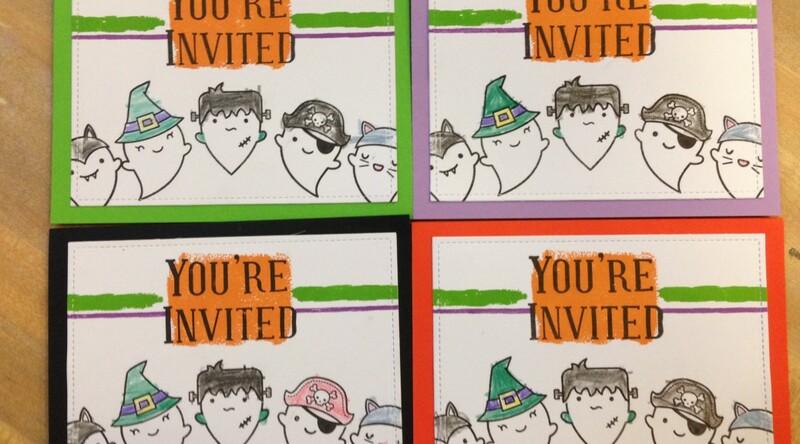 Extra Details: We began these invitations by choosing the card base colors. Then, we die cut white panels for the front of each invitation. My son and I stamped the ghosts, sentiments and lines on the white panels. Then my son colored each panel with colored pencils. When, he was finished, we adhered the panels to the card bases. I print the party info on to white card stock and then die cut the info out with a stitched rectangle die. We adhered these panels to the inside of the cards. 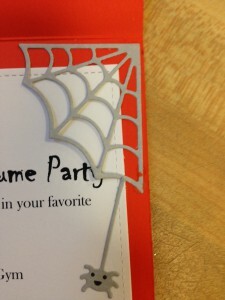 We added a web and spider to the inside of the cards to complete the cards. When I saw this sentiment on YouTube, I immediately thought of my nephew who is turning 11 soon. Extra Details: I began the card by raiding my box of previous colored and cut images. I found enough trees, cars, gifts and cupcakes to make two really cute scenes. 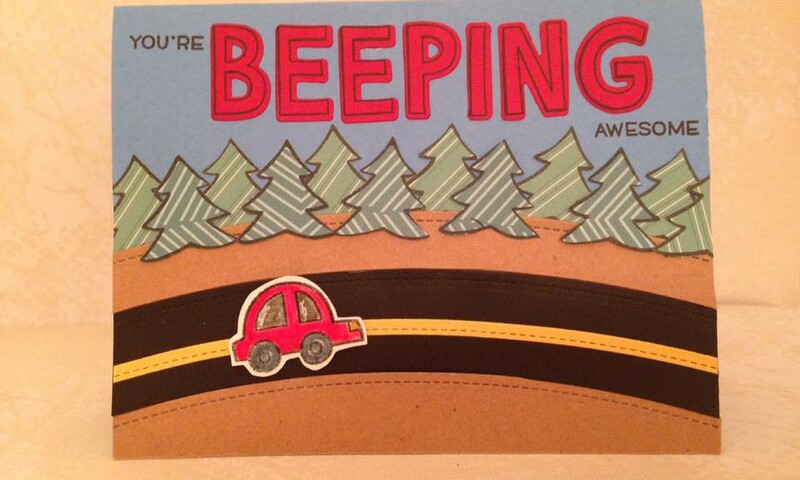 I die cut the letters for BEEPING out of some red card stock. 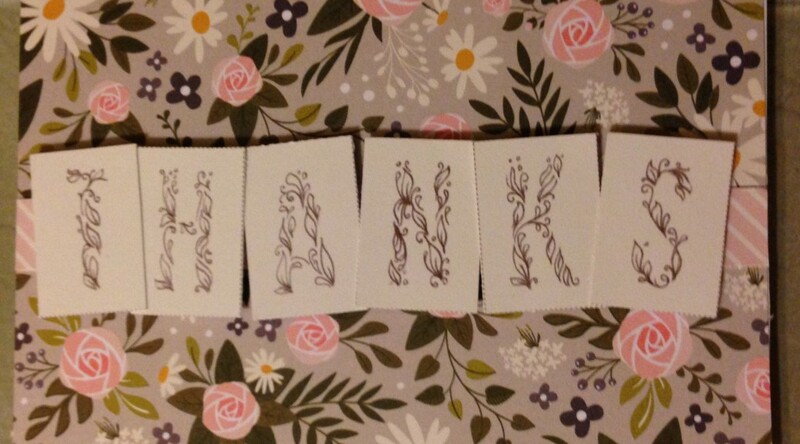 I stamped the black outlines on the letters. I think it added to the masculine feel of this card. 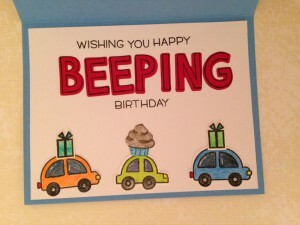 I also cut the hill and road for the card front using a simple stitched hillside die. Then, I adhered everything to a blue card base. I finished the sentiment by stamping the smaller words in black ink.